Granted, most of this is speculation, but hey. You’ve been warned. So this model popped up on the PTR’s last week and a debate began raging over whether or not it was Bolvar. Enough time has passed. It’s time to weigh in. Yes. It’s Bolvar. In fact it’s so painfully obvious that it’s Bolvar, only someone heavily in denial could claim its not. The belt and boots match, it’s obviously an altered human. But that’s all nitpicky. Here’s the real logic behind why this is definitely Bolvar (and what that means). In the Yogg-Saron fight you might get a glimpse of the “Immolated Champion”. He’s a prisoner to the Lich King. Now… check him out in the model viewer here. The Java version looks better if your machine can run it. The “Immolated Champion” is obviously the in-between phase for when Bolvar was alive in Dragonblight and the smoldering being he is now in Icecrown. 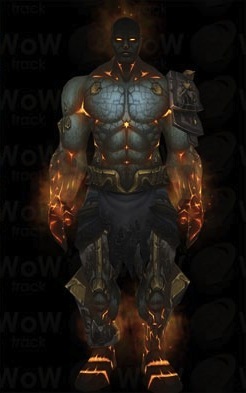 Bolvar = Immolated Champion = Smoldering Being. So what does this all mean? Personally, we though the Lich King’s “Ultimate Death Knight” was going to be faction specific. If you were Horde, you’d face Saurfang the Younger. Alliance would in turn fight Bolvar. Now though, it seems we will all face Saurfang the Younger. So what does that mean for Bolvar? It definitely puts him back into play. Since he’s not just an all out boss, Blizzard definitely has something in mind for him. On one hand this could simply mean he has some nifty scripted event before becoming… an all out boss. It could also mean we save him. Then gain, it could also mean we don’t. If anything, this seems to say that Northrend does not end happily. There won’t be any Ewoks dancing and statues being toppled after Arthas is killed. So…. what’s the saddest, darkest thing that could happen? Us having to kill Bolvar? We’re still big fans WotLK ending with Varian Wrynn beginning his journey towards becoming the next Lich King. It’s edgy. It fits the profile. It works. Arthas was forced to kill the people of Stratholme. That was his key turning point. Could Varian Wrynn be forced to kill Bolvar? Could that be his turning point? Presuming that the Bolvar/Saurfang fight is not faction specific means it could possibly be a timed event or hardmode switch? I’m guessing it also means the standard fight does not involve both Bolvar and Saurfang meaning 1 may die before you reach there. * Reach Bolvar after he’s been turned and he hasn’t killed Saurfang yet – fight Bolvar and Saurfang at same time? Of course the 3rd situation (both at once) sounds the hardest but it wouldn’t be the hardest to reach on time (before bolvar is turned). Imagine trying to turn someone so pure and attached to the light that as they resist the darkness the powers of light and dark collide so strongly that it burns the medium that they fight over. That’s my quick thought about it. Because he definitely looks like a walking ashbringer to be quite honest. Metal, smoldering light, a terminator gaze that screams “get in my way, I will kill you” So if we fight Saurfang, who says we HAVE to fight Bolvar? Where and how does this indicate Bolvar? Yea he’s a bad dude, but all of us flocking to it seems hasty. It could be another major lore figure like Uther and blizzard might have something else in store for fordragon. Blizzard puts stuff on the PTR like this because they KNOW people will data mine it, you get incomplete random models put up and suddenly taken away, but this, a fully rendered complete model this is just a give away. I’m not saying it cannot be Bolvar, though speculation is always good ;). I’m really curious to see how this pans out because what that model shows is nothing like the lich kings previous creations, hell it looks more menacing and intimidating than Arthas himself. Someone sacrifices him self to the ashbringer much like First Ashbringers wielder, and something really badass happens instead of the holy light explosion. JUSSAYIN, This is Blizz, granddaddy of the left field. why do you feel there will be a next Lich King? The scourge needs a leader, without any leadership whole azeroth is going to be overun. The tiny bit of Arthas that still is inside the Lich King holds the undead leashed…..and it needs a new leash when the Lich King is nomore. Bolvar could be his own faction. Well, also, look at the tendency Arthas has to bone over his enemies. Look what he did to Sylvanus. She’s not just a banshee, she’s THE banshee. Bolvar has been a thorn in his side for how long? Immolated Champion/Smoldering ….Dude…. I mean, think about it. Burning for eternity. He could be in constant pain that drives him beyond sanity and makes him into nothing more than an undead wraith blazing with pure rage. Only Arthas really has the power to keep him on a chain. When Arthas kicks it, BFF (Bolvar Fordragon Flambe) up there might just go batshit with nobody left to tie him down. So the players waste ’em and, I dunno, throw him in a lake to put him out or something, he has a heartfelt speech and then dies. Ithink it has mabye just mabye some ties with Cataclysm.